The leading technology company ups performance yet again with its latest and greatest graphics card. You might remember that recently we reported the arrival of NVIDIA's top-end GPU the TITAN X. 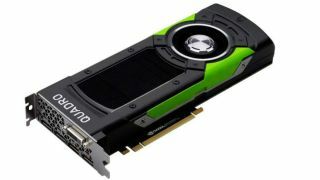 Not a company to rest on its laurels, NVIDIA has upped performance yet again, unveiling its new Quadro P6000 – the world's fastest ever GPU – at annual computer graphics conference SIGGRAPH last week. The graphics card is targeted at designers who have to create complex simulations for everything from applying special effects to virtual reality games. The P6000 has 3,840 cores and 24GB of GDDR5X memory. It supports 432GBps (gigabytes per second) of memory bandwidth and has four DisplayPort 1.4 slots, supporting resolutions up to 4K at 120Hz and 5K at 60Hz. The GPU also has internal pipelines to render faster 3D video. The NVIDIA website states: "NVIDIA's most powerful GPU architecture ever, the new Quadro products bring a whole new level of performance and innovative capabilities to power visual computing on the desktop, in VR, or on-the-go."